Gene therapy describes treatment of diseases by modifying the genome of the affected cells. Delivery of the corrected DNA is usually done using modified viruses. Gene therapy is usually used in diseases where one fault protein causes the symptoms, and a working copy of the gene can be delivered into the cell to allow it to produce the correct product. Adenosine deaminase deficiency is an example of a genetic disease that has been successfully treated with gene therapy. Gene therapy is the repair or replacement of faulty genes with healthy versions. It is carried out by introducing DNA containing the functional gene into a patient, to correct a disease-causing mutation. Gene therapy was initially concocted in 1972, but has had limited success in treating human diseases. This can be largely attributed to technical difficulties in delivering the therapies, and the associated risks. The success in gene therapy has been limited to somatic cells. These cells are the cells that make up our body but are not inherited, as opposed to the gametes, which are egg and sperm cells that make future generations. This means that any changes made to the genetic material in a patient are not passed on to the children. Gene therapy is likely to be a promising treatment option for certain genetic diseases in which there is one faulty gene that affects a particular cell type that can be repaired. How are the therapies delivered? One major obstacle in delivering effective gene therapy is how to get the new DNA into the cells that are affected by the faulty gene. One of the most promising methods of DNA delivery is through the use of viruses. Viruses are small infectious agents that have evolved mechanisms to be highly efficient at infecting our cells. They can deliver their own genetic material into host cells, and use the host cellular machinery to synthesise proteins that help them to produce more viral particles. Their ability to deliver DNA into cells makes them a highly useful tool for delivering genetic material to patients. Researchers can remove the disease-causing DNA, and add the therapeutic gene. Now, the virus can infect the required cells (without causing disease) and deliver the healthy gene into the cell’s genome. The DNA is expressed by the cell’s normal transcription and translation machinery, so the cell can produce the correct protein required to prevent the disease. How can the faulty gene be repaired? 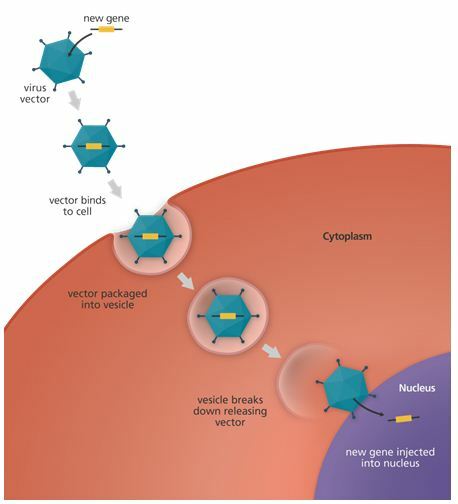 Gene augmentation therapy is used to treat diseases where a mutation in the DNA causes a loss of the function of a gene, stopping it producing a working protein. Gene augmentation therapy adds DNA containing a functional version of this gene back into the cell. This type of therapy only works if the lack of the functional protein hasn’t caused lasting damage to the body, or wasn’t required during development. Gene inhibition therapy is used in the treatment of diseases caused by spurious gene activity, either by the gene being over-active (perhaps the gene is on when it should be off) or by production of a new protein that interferes with the function of another gene. Gene inhibition therapy aims to reduce or stop the activity of the problematic gene. This is particularly useful in cancers, which are often caused by the over-expression of genes that promote cell growth and division. Targeted killing of specific cells is also used in cancer gene therapies. The aim is to deliver DNA into a diseased cell as before, but this time the DNA is designed as such that it will kill the cell. This can be done in various ways, and one of the most effective ways is inserting a gene that programmes the cells to die, a ‘suicide’ gene. This method carries an extra risk: it is essential that the inserted DNA is targeted appropriately to avoid killing healthy cells. Adenosine deaminase deficiency is a form of severe combined immunodeficiency disease (SCID). It is caused by a defective enzyme, adenosine deaminase called (ADA) and causes problems with the immune system. Gene therapy can be used to treat this disease. The ADA gene can be delivered to affected babies using a modified virus. Firstly, some bone marrow is extracted so that the correct DNA can be added directly to the affected cells, and the cells are put back into the body. Once the corrected cells are back in the body, the corrected gene allows the cells to produce the enzyme, generating healthy blood cells that can largely outcompete the faulty cells in the blood. This improves the health of the baby. Although in principal gene therapy seems simple, there are many technical, biological and ethical challenges. Delivery of the gene to the correct place and making sure the cell can utilize it appropriately is crucial for success and also to avoid adverse effects. Similarly, care has to be taken to ensure that the gene does not insert into a place where it can disrupt the function of other genes.